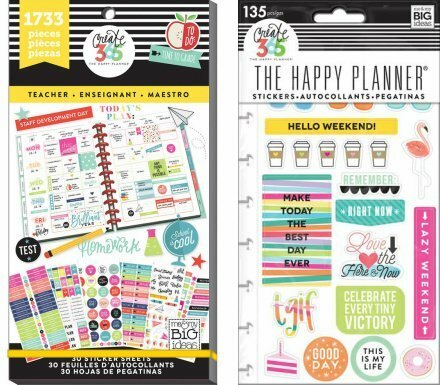 These stickers make it easy for you to customize your Happy Planner, making everyday routines even more fun. Designed to fit in the daily column of your weekly view in the classic Happy Planner, these themed stickers will help you plan and give you a boost of confidence along the way. Bundle includes 2 items: Sticker Value Pack & TGIF Snap-in Pack. These teacher and goal-themed stickers will help you plan and give you a boost of confidence along the way. Sticker Value Pack Designed specifically for your Happy planner, featuring gold foil. If you have any questions about this product by Create 365, contact us by completing and submitting the form below. If you are looking for a specif part number, please include it with your message.